OLEH—ISOKO women, under the aegis of Ewheaye Isoko have empowered women in the area with high profile cassava stems species. President of Ewheaye Isoko, (home branch), Mrs. Catherine Ilolo, told Niger- Delta Voice at the 2.5-hectare cassava farmland at the Isoko South secretariat, Oleh that the cassava stems were bought from ITTA Ibadan, last year. 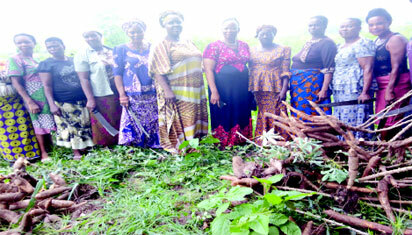 Isoko women inspecting the high profile cassava stems and roots. “We planted them and we are now trying to spread them into the area in order for our women and people to benefit from them. The cassava stems are high profile species that contain vitamin A that will help those who are suffering from diabetes and eye problems and also reduce the sickness in the area. “In future, the youths from the area will be involved in the process to encourage them to be self-reliant through agriculture, but for now, the process is basically for the women,” Mrs Ilolo said. She commended the Isoko South Local Government Council chairman, Sir Constantine Ikpokpo for providing them the 2.5 hectares of land in the secretariat. The post Ewheaye Isoko empowers women with high profile cassava stems appeared first on Vanguard News.